Sony unveils premium 4K HDR ZD9 TV series | What Hi-Fi? The top tier 4K HDR Bravia Z series consists of 100in, 75in and 65in TVs, with improved technology promising better detail, colour and contrast. Just when we thought we’d seen all of Sony's TVs for 2016, the company has taken the wraps off a brand new premium series: the ZD9. The Sony ZD9 TV range features a 65in, a 75in and a mammoth 100in screen. In the UK, the 65in will cost £4000, the 75in is £7000, and the 100in will cost you an outrageous £60,000. All TVs feature flat screens with subtle gold accents on the edges, and a grid-patterned back panel that hides all the connections and wires. The ZD9 slots in right at the top of Sony’s Bravia range, and sports plenty of new technology to improve its picture performance when it comes to delivering Ultra HD 4K and HDR (high dynamic range) video. Yes, that's the 100in screen. New to the ZD9 is the X1 Extreme image processor, which promises 40 per cent more processing power than the current X1 chip seen in the XD93/XD94 range. Sony claims the X1 Extreme is responsible for delivering more accurate noise reduction and detail enhancement, deeper blacks and brighter whites, and much smoother colour gradation. The ZD9 series employs “object-based HDR remaster”, which looks at specific objects in a picture when it's upscaling standard or high definition content to 4K HDR. Sony claims this lets it control exactly how those objects should look in HDR, rather than just boosting the picture’s contrast and colour as a whole. Another new technology is “backlight master drive”, where the TV has full control of each individual LED in the ZD9’s full LED array backlight. Interestingly, Sony has continued to rebuff the UHD Premium logo that its competitors – LG, Panasonic and Samsung – have adopted, sticking to its own 4K HDR sticker and standards. 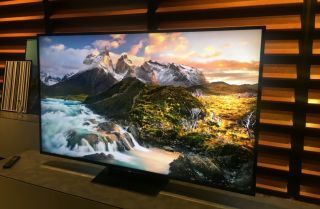 Sony has refused to quote any numbers when it comes to the TV’s brightness, claiming that numbers distract from how good the Sony’s picture is. Well, Sony would say that. The company did, however, claim that its measurements exceed those set by the UHD Alliance. An updated version of Android TV (6.0/Marshmallow) will return as Sony’s smart platform, while all three screens will also support 3D (remember that?). All three Sony Bravia ZD9 TVs will be available in UK before the end of the year. MORE: UHD Premium: What are the specs? Which TVs support it?